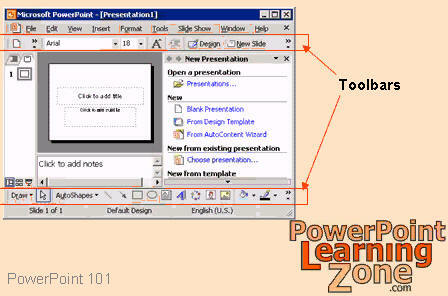 We use PowerPoint 2003 in this course, but the lessons are valid for all versions of PowerPoint from 95 to 2003. 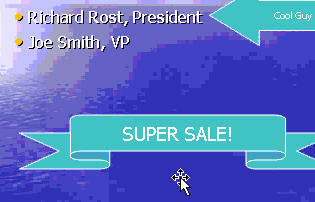 There are cosmetic changes in PowerPoint 2007. Order before 4/26/2019 to get a FREE upgrade to our 2007 version when released! First, we show you how to start Microsoft PowerPoint, and go over the different parts of the screen: the title bar, the tool bars, the menu bar, the slide area, and so on. 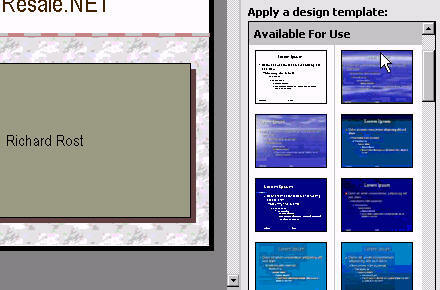 We'll also talk about slide sorter, the outline view, the notes area, etc. Unlike a lot of PowerPoint courses, we're not going to spend a lot of time going through the AutoContent wizard - a tool that lets you build presentations quickly, but they look like "cookie cutter" presentations. We are going to run through building a quick presentation with the wizard, but that's all. We'll go through changing the design template, and making some other basic cosmetic changes. We'll show you how to edit the components of a slide: editing text, formatting text, changing colors, moving text boxes, resizing objects, and so on. We'll show you how to navigate through your slideshow, and teach you some quick tricks for editing text. We'll show you how to delete slides, add new slides, and move slides around. We'll teach you how to make web and email hyperlinks inside your slideshow. We'll cover saving and loading your presentation to/from disk. Next we get into the heart of building a presentation from scratch using the outline view. This is my preferred way to build a presentation. We'll show you how to get all of your ideas out first, and then worry about formatting your slides. We'll talk about outlines in detail, show you how to promote and demote levels within an outline, and edit slide data accordingly. In lesson five, we'll cover editing your home-made slides. This is the free demo lesson we have included here on the web site. Visit our Demo section to check it out. We'll apply a design template to our blank presentation, we'll adjust the bullets and other text, and show you how to make other changes. We'll teach you how to add graphics, clipart, drawing objects, and images to your slides. We'll show you how to insert clipart from the Microsoft Office collection into your slides, and how to use the clipart manager. We'll show you how to resize, move, rotate, and adjust these images. We'll teach you about the drawing and pictures toolbars. 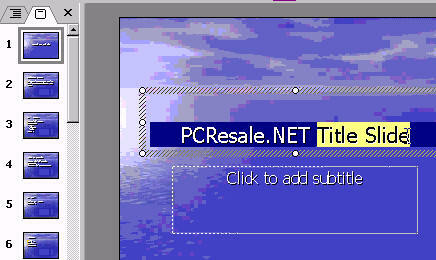 We'll add text boxes, lines, boxes, and more to our slides. We'll also cover banners, callouts, and more. In lesson eight we'll teach you how to organize your slides, and teach you how to give your presentation. We'll spend some time in the slide sorter, moving slides and groups of slides around to arrange our slideshow. We'll give you tips for presenting, and show you some tricks for navigating through your slideshow like a pro in front of your audience. We'll also show you how to print your slides.